Indiana Epsilon alumni and undergraduates frequently share stories of their most cherished fraternal memories, many of which include their experiences while living in either the Wolf Den or 801 Mound Street. A facility has played an important role in the success of the Chapter and our members’ collegiate years. It is our chapter house that augments the basic fraternal experience and facilitates an environment for competitive recruitment and a place where camaraderie flourishes. However, and even more importantly, our chapter home allows today’s collegians access to the best technology, equipment, tools and resources for studying, healthy living and long-term scholastic success. Our home serves as a proud symbol of our shared values and goals. Valpo’s campus, anchored by the Chapel of the Resurrection, has seen sweeping changes. The new Harre Union, Christopher Center Library, Fites Engineering Innovation Center and Center for the Sciences have changed Valpo’s landscape significantly over the last decade. Today, the sororities also have a new home, the Sorority Housing Complex, and campus residence halls have been overhauled. The standard for student living at Valpo has changed, and we must change with it. 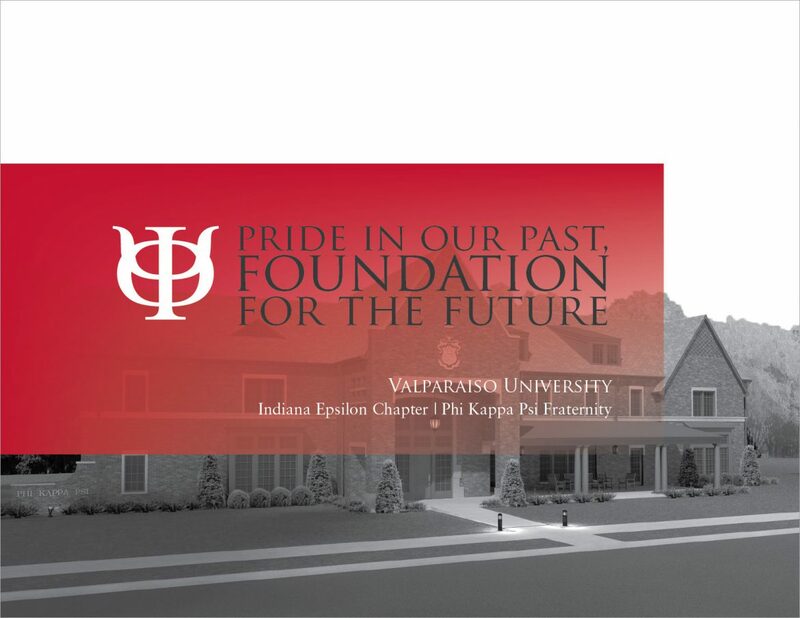 In order to secure our future and propel Indiana Epsilon forward, the House Corporation is embarking on a $2,750,000 capital campaign to build a new chapter facility. This historic project will ensure a competitive, safe and modern living facility to meet the social and academic needs of the 21st century student. This opportunity to secure our future comes at a time when there is a great need for educated, ethical leaders – men of conscience and action who are prepared to take their places in society as citizens, professionals, husbands and fathers. With a new modern home, Indiana Epsilons from all generations will have the opportunity to share in the bonds of brotherhood at Valpo for years to come. Integrity. Service. Honor. These words are sacred to the men of Phi Kappa Psi. We have chosen not merely to revere these words, but also to live by them. On behalf of our 6,000 undergraduate brothers, we thank you for your generous support of the Phi Kappa Psi Foundation.